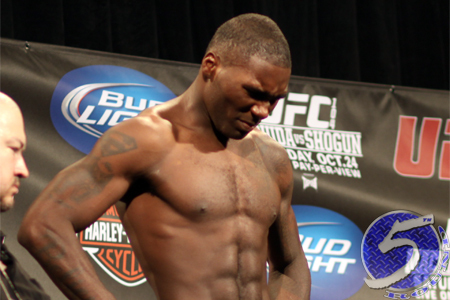 After missing weight for the third time in his 11 trips to the UFC’s scales, company president Dana White hinted Anthony Johnson’s (Pictured) days inside the Octagon might be numbered – win, lose or draw in his shootout against Vitor Belfort. Following Johnson’s 1stRound submission loss to Belfort at UFC 142, White seemed fully prepared to send “Rumble” packing. For a non-title middleweight affair, fighters are allowed to weigh a maximum of 186 pounds, which is exactly what Belfort checked in at. Johnson tipped the scales at an astonishing 197 pounds. White instantly ripped him for his “unprofessional” behavior. On Friday evening, Johnson’s manager, Glenn Robinson, revealed his client was within 1.5 pounds of making weight three hours prior to weigh-ins. However, he became ill during the weight cutting process and was urged by the local doctor to ingest fluids and rehydrate. By the time Johnson bounced back to normal, it was too close to the weigh-ins to resume his weight cut. However, what he put his body through the day before significantly affected his performance inside HSBC Arena in Brazil on Saturday. “My legs just got really tired,” Johnson revealed after having his two-fight winning streak snapped. “I didn’t get beat up in there and he really didn’t hurt me with what he hit me with. It seems he may have to sort things out away from the Octagon. Johnson owns a 10-4 professional record and posted a 7-4 mark for the world’s premier mixed martial arts promotion. While White may be done with Johnson, there will be plenty of suitors willing to roll the dice on the controversial wrestler.